You can now buy Lenovo K3 Note k50-t5 smartphone from Gearbest.com for only $152.89 with free shipping. The Lenovo K3 Note provides a dazzling display with a Full HD screen, an immersive audio experience with Dolby Atmos and blazing fast performance with a 64 bit Octa-core processor. What’s better, packed with a 13 MP rear and 5 MP selfie camera, 4G connectivity and a 3000mAh battery, The K3 Note is nothing less than killer. Every image comes alive in 2 million pixels, on this stunning screen. With its 401 ppi OGS IPS display, you will see visuals in their truest colours and finest details, from all angles. The 8 ARM Cortex A-53 processors, coupled with the ultra-fast 2GB DDR3 RAM makes sure the phone reacts to every swipe at the speed of light, and shows no hesitation to run the most graphic-intensive 3D games. Packing the latest version of Android and bundling it with features that most phones can only dream of, the software is a dream to use and is quick as lightning too. Performance wise this blows most phones out of the water, nevermind the fact that it’s a fraction of the price of so many of the higher-end phones it trounces. More astoundingly for this price range it packs a good 1080p screen, which is both fantastic in color representation, resolution and again overall performance of the device. Like many aspects of the phone the sound output and camera far exceed anything in this price range and often meet or beet that of more expensive devices, even if extra features like a fancy equalizer or extra camera modes aren’t present. Root: Firmware is not rooted, but you can easily root it and install custom recovery, as I did. I rather preffer Hola Launcher than Lenovo VIBEUI stock launcher. There are a lot of Lenovo preinstalled applications, which can be uninstalled easily. Google Play Store and Google Play Services are also supported. This firmware version has not root acces, but it’s easy to gain root acces and install a custom recovery (I chose CWM). Available features: Wifi, WiFi Direct, Bluetooth 4.0. Bluetooth LE, GPS, Microphone, Camera Flash, USB Host, Multitouch & Printing. Sensors available on device: Accelerometer, Proximity, light, magnetometer, orientation, gyroscope, rotation vector, gravity & linear acceleration. 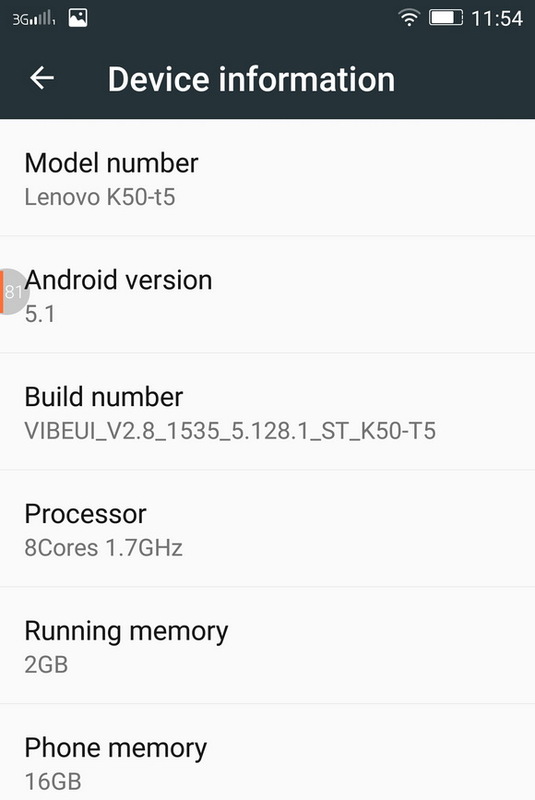 In Antutu Video Tester 3.0 Lenovo K3 Note (K50-T5) scores an good 722 points. It played smoothly almost all video file types. In Antutu Benchmark 5.7.1 64-bit the device achieves also an amazing score, over 46.000 points.